I saw the title of this book on a list of free Kindle books, and on a whim, I bought it without even looking at the reviews. It was on my Kindle for awhile until I finally opened it up. I wish I had gotten to it right away. This is one superb book. The book follows the story of Reza Gard, a young boy whose family is killed by the invading Kreelan, blue-skinned female aliens who seek out close combat in order to honor their empress. When Reza is later kidnapped by the Kreelan, he is thrust into the culture as the empress seeks to see if humans actually have souls or are merely the animals they seem to be. While on the surface, there are several aspects of the book that would usually turn me off a bit. I am not big into the anthropomorphising of aliens, making them little more than odd-looking humans, even with some unique ideas on life. I also felt that it was not realistic that a human could compete hand-to-hand with the physically superior Kreelan, and to have it so was a bit of a case of deus ex machina. But in this case, none of this mattered to me. The author was able to draw me in, and I accepted everything. 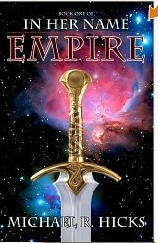 I tend to be rather critical of things, but with Empire, I really didn't care. I was in love with the story, the characterization, the action. I was in love with the book. Of course, I should point out that I am a sucker for a good coming-of-age book, and as this book fits that description admirably, I guess it is not surprising that I loved this book so much. Reza is a fascinating character, well-fleshed and developed. I found myself sympathizing with him, even putting myself in his place. He is a classic protagonist. The one issue I had with him through some of the book (which I won't mention here as it would be a plot spoiler) was taken care of quite well later on in the story. The author's writing style is clear, concise, and appealing. Whereas some authors seem engrossed on the written word as a raison d'etre in and of itself, writing poetically while conveying nothing of interest, this author uses his wordsmithing to convey the ideas and storyline, if that makes sense. The written words support the story, drawing the reader into Reza's world. Mr. Hicks, you wrote that you admire Heinlein, Stirling, Weber, Pournelle, and Niven. Well, sir, I think you have joined them. I don't know what your job is, and I really don't care. You are a writer, period. That is your place in life. I took a quick look at your other books (books I will soon be reading) and doing the calculations, you are doing well sales-wise. It is my fervent hope that you quit your day job and focus on what brings joy to countless others. It is not my place, I realize, to tell you what to do. I am just stating my opinion that I want you to write. I know this is selfish of me, but I can't help it. I know what I want, and that is more from you, more books in which I can lose myself in your universe.